Sumbawa Tambora Trails is an 10 Days Adventure Motorcycle Expedition on 250 cc dirt bikes in Sumbawa. Included is support vehicle, 2 guides and a mechanic in addition to all meals, non alcoholic drinks and accommodation. The strange distorted sprawl of Sumbawa is the result of the violent volcanic eruptions that consequently shaped this impressive island. Adventure Riders Indonesia is excited present our 10 Day off-road dirt bike adventure exploring some of Sumbawa’s best kept secrets. Our Adventure motorcycle tours will bring you to the summit of the mighty Mt Tambora, a super-volcano which in April 1815 exploded in the largest volcanic eruption in human recorded history. We’ll explore the beautiful Moyo Island and its jungle waterfalls. In addition we will ride through wide open savannahs, follow along the islands rugged coastlines. These are home to some of Indonesia’s world class surf breaks. Do you have a thirst for adventure and wild landscapes? If so, join our 10 night Sumbawa Tambora Trails tour and ride the authentic and untamed glories of Sumbawa. We will pick you up Bima airport in the morning, transfer to Kalaki Beach Hotel. After lunch we will have time for a briefing outlining safety, tour program and an introduction to the Kawasaki KLX 250. Late Afternoon we will make a sunset ride around the hills in Bima area and fine tune the bikes if needed. Evening dinner and drinks at hotel. Early morning breakfast and a quick briefing before we start our moto trip to Mt Tambora along Sumbawa’s rugged coastline passing through local countryside and villages. After lunch we ride around the eastern flank of mighty Mt Tambora and onto the Balinese village of Pancasila. Afternoon visit to Mt Tambora’s sacred Balinese temple. Accommodation and dinner at Tambora Guesthouse. 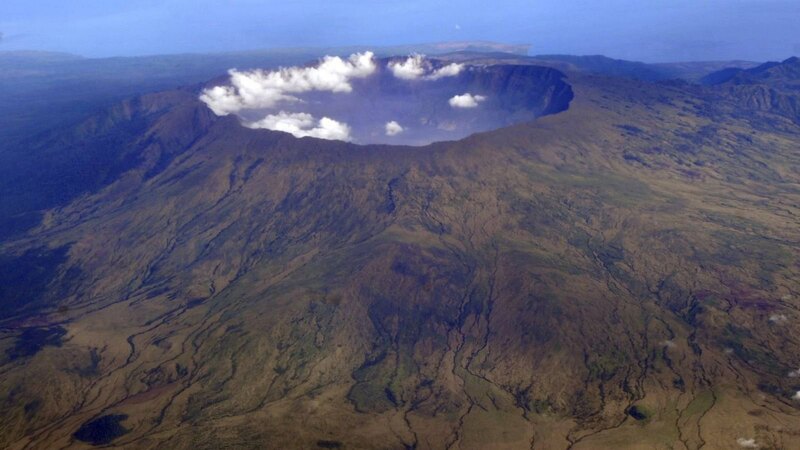 By far one of Sumbawa’s most impressive features is its Active volcano Mt Tambora. In April 1815 it exploded in the largest volcanic eruption in recorded history. Global temperatures dropped as low as 3 degrees. Crop failures and starvation swept much of western Europe, killing thousands. The year 1816 was called the “year without a summer” Today Tambora is asleep and you must look closely to see remnants of it violent past. We will start our ride to the eastern slope of Tambora where the terrain is more favourable for dirt bikes. Normally it’s a 2-day trek to Tambora’s summit, we will use the back door and ride up the 4X4 road that leads to position 6, only a 1 hr trek to the summit. Sunset we will reach the top of the crater to take in one of the most spectacular views in Indonesia. Evening we will camp at position 6. Early breakfast and one of the most spectacular sunrises you find in Sumbawa. Today we ride our motorcycles down the slopes of Tambora and to the coastal port town of Calabai. In addition to this, we have excellent off-road riding as we traverse this impressive volcano. Afternoon we arrive in Calabai. Early morning, we take the bikes on a 30 min boat ride across to the beautiful island of Moyo. Famous for its deserted beaches and stunning waterfalls, Moyo is a must for anyone travelling through Sumbawa. We ride to the far end of the island visiting Mata Jitu waterfall and beaches along the way. Afternoon we will take another short boat trip across to Sumbawa Besar. Firstly, we start our motorbike adventure in Sumbawa Besar and make our way up through dense mountain forests and into Sumbawa’s central highlands. After quick lunch break we then take a wide-open track to Baturotok Village, famous for some of the best coffee in Indonesia. Breakfast and a quick cup of Baturotok delicious coffee and we ride south through lush rainforests and onto Sumbawa’s southern coastline. After lunch we ride to Maluk passing through beaches and dense jungle along the way. Afternoon in Maluk and a chance to surf one of it’s famous surf breaks. Breakfast and a morning motorcycle ride along Sumbawa’s magnificent west coastline and up to Mantar. Afternoon we make our way to Poto Tano and take a small boat trip across to the Stunning little island of Kenawa. Following beach camping and BBQ dinner. Breakfast on Kenawa, and final day ride back along the north coast road to Sumbawa Besar. Breakfast, final goodbyes and transfers to Sumbawa Besar Airport.